X-Lab shares the thinking and techniques behind current work by our fellows and residents via the Sandbox: a space inside X-Lab designed for testing and workshopping new works currently in process. Up to four artists at a time will install their work with a focus on getting feedback from the public and sharing their creative processes. It’s an excellent opportunity to meet the artists and learn more about their work directly through their creative practice. Each artist’s project is designed to engage visitors and open up new thinking around interactive design. The public is invited to interact with the artists’ works during our X-Lab Open Hours: Tuesdays, Thursdays, Fridays, and Saturdays, 12PM – 6PM. Docents will lead visitors through the space and introduce artists during those times. SCHEDULE OF ARTISTS IN SANDBOX (Dates are subject to variation due to the process oriented nature of the projects; this schedule will be updated throughout X-Lab). Go here to learn more about X-Lab. BROOKE SINGER • READ ME FILES, Read Me Files is part of an ongoing investigation into the built environment. Brooke is specifically considering products we use for personal and domestic hygiene. We recognize logos and packaging far more readily than the chemical ingredients the products are comprised of and that we, quite literally, consume. The interactive video installed in X-Lab employs written and spoken language to underscore this disconnect. By identifying our everyday products through a list of ingredients rather than the branding, they become mysterious and foreign to us. The recorded video from this installation will become source material for a single channel video. KAHO ABE • NINJA SHADOW WARRIOR, Ninja Shadow Warrior is a stand alone arcade game built with a screen and webcam. The goal is to fill out the shadow of an object as accurately as possible. The scores based on accuracy are kept on a leader board. The game structure of Ninja Shadow Warrior naturally supports face-to-face interaction, as more details can be filled out when more people are playing at once. This game will experiment with crowd sourcing content for the shadow object database. As part of X-Lab, Ninja Shadow Warrior will be set-up for early user testing. The scoring element for this game will be in development throughout the Sandbox period. AARON MEYERS • 3D SCANNING STATION, Aaron is working on setting up a real-time 3D scanning station in the X-Lab using a technique called structured light. This works by encoding a three frame sequence of images with a tightly synced horizontal line pattern, which is then seen by a webcam and decoded on the computer into a cloud of 3D points. For X-Lab, Aaron is using a software library written by Kyle McDonald, who has done a lot of great work with structured light. Kyle stopped by Eyebeam during early set-up to share some of the finer points of the setup and the software. KAHO ABE • NINJA SHADOW WARRIOR, Ninja Shadow Warrior is a stand alone arcade game built with a screen and webcam. The goal is to fill out the shadow of an object as accurately as possible. The scores based on accuracy are kept on a leader board. The game structure of Ninja Shadow Warrior naturally supports face-to-face interaction, as more details can be filled out when more people are playing at once. This game will experiment with crowd sourcing content for the shadow object database. As part ofX-Lab, Ninja Shadow Warrior will be set-up for early user testing. The scoring element for this game will be in development throughout the Sandbox period. DAVID JIMISON • Native Tekn0, imagines an alternate history in which Christopher Columbus discovered the Americas inhabited by technologically superior natives. More specifically, Native Americans with lasers, techno music, and robots. Were this alternate universe actual, what would our contemporary Thanksgiving be like? Native Tekn0 is engaged with colonization as the fantastical appropriation of history (the Disney version) both in regards to the ramifications of a pop cultural machine that displaces the actual horrific history, and to western belief system that technology equates with superiority. (Will be installed 11.22.10). BROOKE SINGER AND STEFANI BARDIN • COUNTER KITCHEN, In the Counter Kitchen (TCK) Brooke and Stefani will be turning things upside down from the inside-out. Science and marketing have made product labels nearly impossible to decode. Learn how to reverse engineer your favorite food, personal care and household products using TCK tools and measurement systems. STEFANI BARDIN • M2A™: The Fantastic Voyage = is an installation built around the first ever clinical study to use the M2A™ Capsule and SmartPill wireless gastroenterology devices to look at how the human body responds to processed versus whole foods. 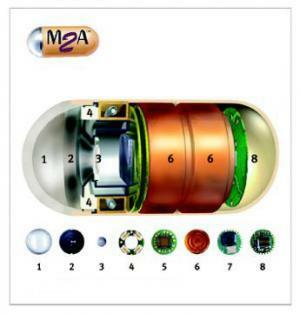 The M2A™ Capsule records video and the SmartPill collects time, pressure and pH from within the GI tract. The prototyping for this installation will include projection of the visual data from the M2A, sound design of the informational data from the Smart Pill and the testing of artificial food scents simulating the meals used in the clinical study. TED SOUTHERN • Frontier Prime Space Suit, During X-Lab, Ted will be constructing and testing a single-layer space suit pressure garment. Construction will include heat sealing and laser cutting prototypes and demos; lab testing will involve full suit try-outs to test range of motion and user comfort, along with individual component testing, such as arm-burst tests and flexion torque tests. Also included in Ted’s X-Lab work is a vacuum chamber glove box, which will allow public interfacing to test comfort and cycling for pressure garment gloves, the most functional and complex parts of pressure garments.